Technically, I’m the E in STEM. My degree is in mechanical engineering, and before becoming a full-time writer, I worked in the automotive and aerospace industries. But my first STEM love was M. Can I get a hip-hip-array for MATH? 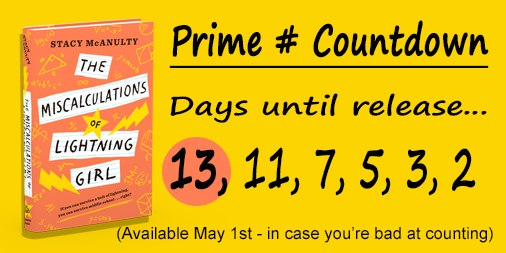 In my debut middle grade novel, The Miscalculations of Lightning Girl, the main character Lucy is a 12-year-old math genius and an all-around numbers nerd. And I mean this as the highest compliment. She is not me. I am not a genius. But I am a STEM girl and have been since stem was only part of a plant and not a career path. I have an author bucket list. It started simple. 1) Get traditionally published. I guess I was naive because I didn't realize how this list would grow (and continues to grow). But one thing that's been on my radar for years is a mention on A MIGHTY GIRL. Their mission is to inspire girls and they highlight women and girls who are making a difference. Earlier this week, they had The Miscalculations of Lightning Girl as a "Mighty Girl Pick of the Day." Thank you, Mighty Girl, for sharing my novel and all that you do for girls. Olivia and I have something in common. A bit of apprehension when it comes to roller coasters. This story makes me giggle. Here's what her mom shared. We could all be more like Olivia and say to ourselves, "I have to overcome my fears." This is Charlotte and her parents. And here's their story that mom shared with me. Charlotte and her mom are certainly super heroes. Peter (age 7) was just diagnosed with Crohn's disease in July. He's spent the summer on the couch or in doctor's offices. He had to brave shots, an IV, blood draws, and anesthesia. He also had to endure a colonoscopy after months of stomach pain. Now that he's feeling better, Pete learned how to ride a bike without training wheels! 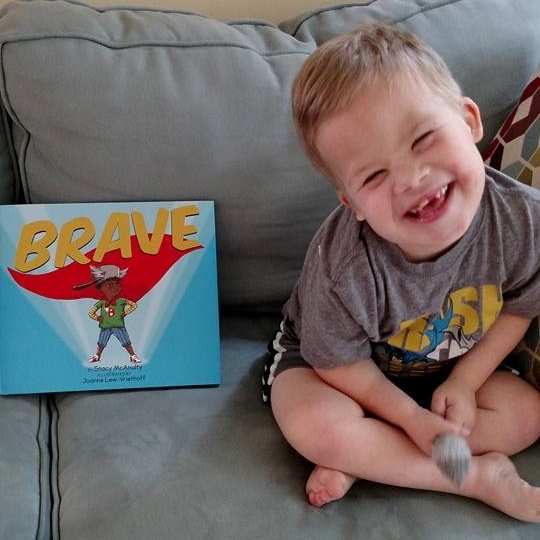 We are so proud of him for being brave! Kids are amazing and inspiring. Here's my growing collection of pictures sent to me by fans of Beautiful. These were all shared publicly on Instagram, Facebook, or Twitter. I love them all. Please keep sending these pictures my way. This picture was shared by Anne Turner on Facebook. She asked her kindergartners to dress in whatever made them feel beautiful. From Jackie Fioretino on Twitter. This second grade teacher asked her students to add a page of text to the book. From Jill Merkle on Twitter. They read the book on International Women's Day. Thanks @darlingconcept on Instagram for this darling picture. Another wee one reading Beautiful on Instagram from @lifeisgood10. From Shelly Moses on Twitter who wrote: Blessed to share it with my BEAUTIFUL girls! Emily Kilgore wrote on Twitter: Student bought me this book from the #scholastic #bookfair and I am in LOVE! In case you missed it, here are all the stops of the Fuzzbuster Blog Tour. Fuzz and I had a great time. For the month of February, I was a "Critique Ninja" at 12x12. Each day I would stalk the "full manuscript forum" and select one to critique. It's still not clear if the selected manuscript (and writer) was lucky or cursed. In total, I gave my opinion to 24 or 25 pieces. (I did take a few days off.) Here are my takeaways from this experience. I don't feel qualified to critique rhyme. So I avoid those manuscripts for the most part. I also stayed away from anything over 700 words. IMHO, these are just too long. This year I didn't review any non-fiction, but that was more just by chance. Quite a bit of talent! Every manuscript I critiqued had potential. Some days, I got lucky and the first post I clicked caught my attention. Other days, I'd read 3 or 4 before selecting a manuscript. So even if I was harsh in my critique, there was something that drew me to that manuscript's potential. Think of me as your mother-in-law. I complain about everything. I'm never happy. Even with my own work. When I read my published books aloud at schools and bookstores, I still edit. (I drop a few words every time I read Excellent Ed.) We can all be a kind kidlit community, but when it comes to critiques, I prefer the brutally honest folks. Tie the ending to the beginning. Something in those first lines should be reflected in those last lines. I love it when it's very direct. Maybe even the same exact words. Or a change of 1 or 2 words. Once you have a satisfying ending, I encourage you to go back and see if you can tweak the beginning to reflect or hint at the last pages. Or look at the opening and see how you can put those feelings, words, or intentions in the last few lines. Ninjas. There were more than critique ninjas floating through the forums. They were popular characters. Characters named after their species. A duck named Duck. A bear named Bear. Friendship. Stories about making friends or making-up with friends. Engineers and Scientists. And most of these STEM characters were girls. Keep writing. And keep critiquing each other. Writing--it's easy to fall into the trap of revising the same manuscript again and again. And yes, a manuscript will require 6, 7, or 20 rewrites. But that can't be all you're doing. Take a break between revisions and start something new. I promise your brain is still working on manuscript-A while you are writing manuscript-B. Critiquing--I was reading manuscripts nearly every day this month. And I'm a better writer for it. I see "problems" in other writers' works that are also in my own. I notice the strengths too. Make a commitment to read a manuscript every other day (or every third day) and make at least 1 constructive comment (not just I-like-it comments) and I promise you will learn and your own writing will improve. Good luck! PS: For the most part, I do not go back and read any follow-up comments to my critiques.